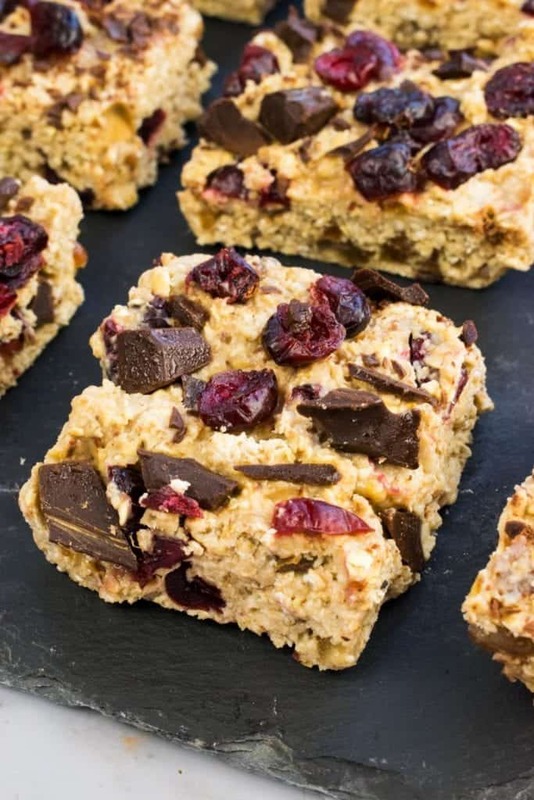 These simple, soft and delicious No Bake Cranberry & Chocolate Breakfast Bars are a nutritious and filling way to start your day. Packed with flavour from the cranberries, and with a dark chocolate sweet fix, they’ll have you going from morning until lunch! 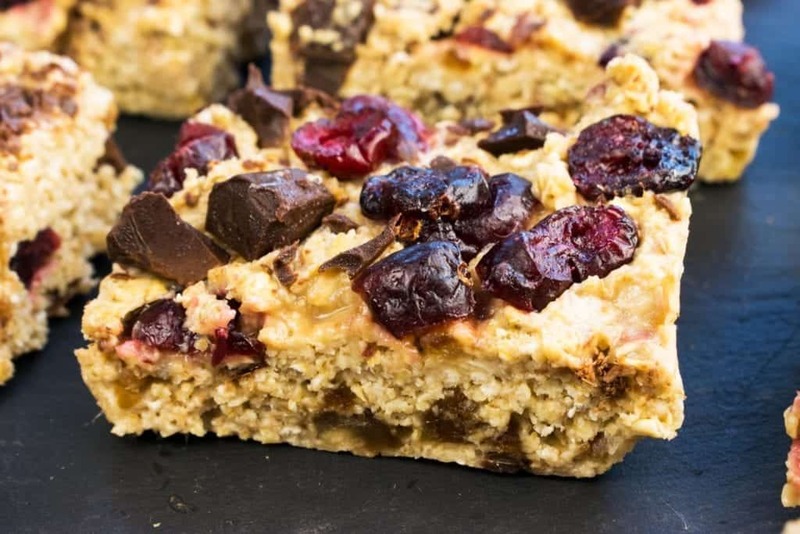 You can’t get much easier than these no bake breakfast bars when you’re looking to meal prep a healthy breakfast choice and the fact that they’re both gluten free AND Slimming World friendly just makes them all the better. They have a soft and slightly sticky texture and the recipe makes enough for you to enjoy to per day for six days! 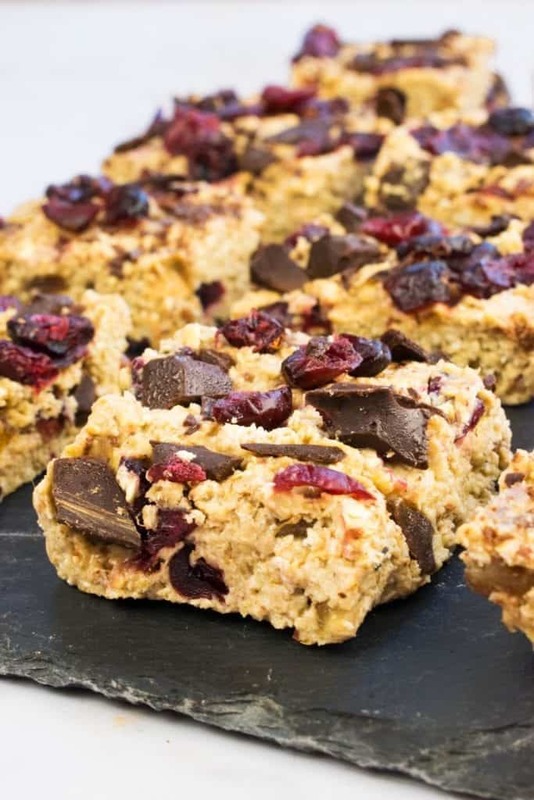 These Healthy No Bake Cranberry & Chocolate Breakfast Bars are a healthy and super nutritious choice in their own right, but they’re also ideal if you’re following Slimming World. Each bar counts as half of your Healthy Extra B choice for the day plus 2.5 syns. This means you could have up to two per day and use just five syns in total, in the knowledge that you’re enjoying something that has real nutritional value from the oats, banana, cranberries and even the chocolate! All of the ingredients used, give something different nutritionally, as well as packing in the taste sensation! 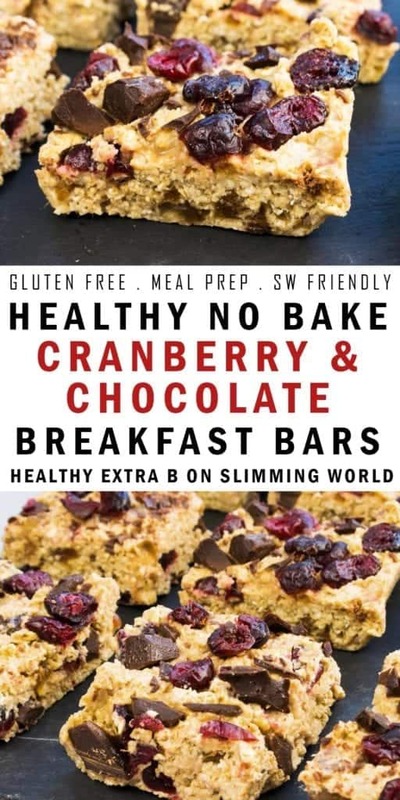 If sweet cravings are something you struggle with on Slimming World then making these breakfast bars is a great choice, as both the chocolate and cranberries will help to curb those urges. Not only that, but oats are so full of fibre, making these super filling. I like to have one for breakfast and then another at around 10/11am when I take a break from work. But whether you stick to one, or enjoy two together or throughout the day, they’re certain to fill you up! If you’re on the hunt for a gluten free, meal prep breakfast choice then these breakfast bars are an excellent choice. Simply double check that the oats you’re buying are marked as gluten free and you’re good to go! When it comes to sweetness, these are also a brilliant way to start the day. Whilst the chocolate might not be strictly speaking classed as ‘naturally sweet’, dark chocolate has a whole host of health benefits and the rest of the ingredients in these bars give you all of the natural sweetness you’re looking for. These breakfast bars are also dairy free if you use a dairy free chocolate! I love seeing when people make my recipes! So if you do make this recipe for Healthy No Bake Cranberry & Chocolate Breakfast Bars then you can email it to me or share it on Facebook and Instagram tagging @basementbakehouse on Facebook or @basementbakehouse_sw on Instagram! 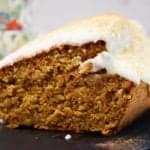 I’d also love it if you shared your baking in my Facebook group too, you can join here if you haven’t already. Whether you’re making them to enjoy at home, or meal prepping for a healthy ‘take to work’ breakfast, these breakfast bars are the ideal choice if you enjoy healthy, nutritious and delicious food. Simply store them in the fridge or freeze and defrost for later! 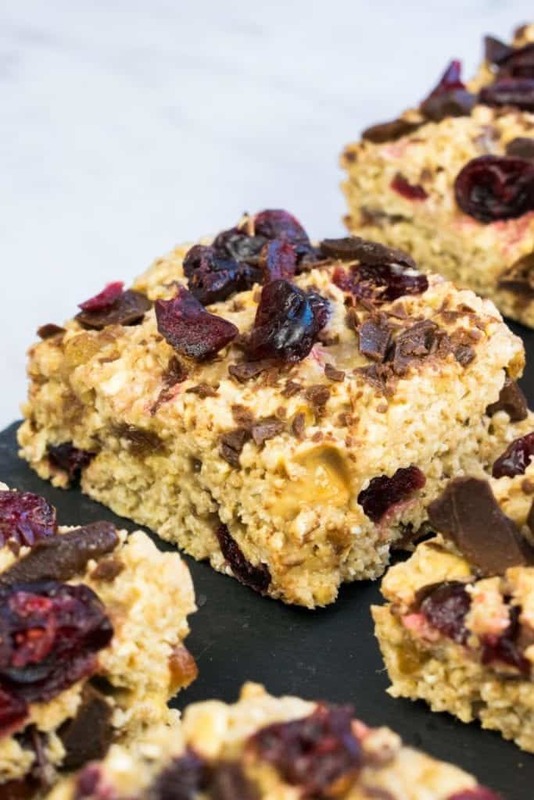 Simple and nutritious gluten free breakfast bars with cranberries and chocolate for the perfect morning sweet fix. 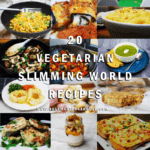 Slimming World friendly and can be used as part of your Healthy Extra B! In a blender , combine the oats, dates, banana, honey and water. Blend until semi smooth and sticky. Tip into a mixing bowl. Add half of the cranberries and chocolate and combine evenly through the mixture. Tip out into a small baking tray that has been lined with cling film or baking paper. Using the backside of a metal spoon, spread the mixture evenly in the baking tray. Distribute the rest of the cranberries and chocolate over the top and press them down gently so they stick into the mixture. Cover and refrigerate for at least 3 hours, but preferably overnight to allow them to firm up better. Refrigerate or freeze for later! To ensure that these are gluten free you must check all of the individual ingredients that you purchase to make sure they do not contain gluten contaminates and are marked as gluten free. Each bar counts as 1/2 Healthy Extra B + 2.5 syns on Slimming World. Please do not screenshot this recipe as syn values may change in the future. 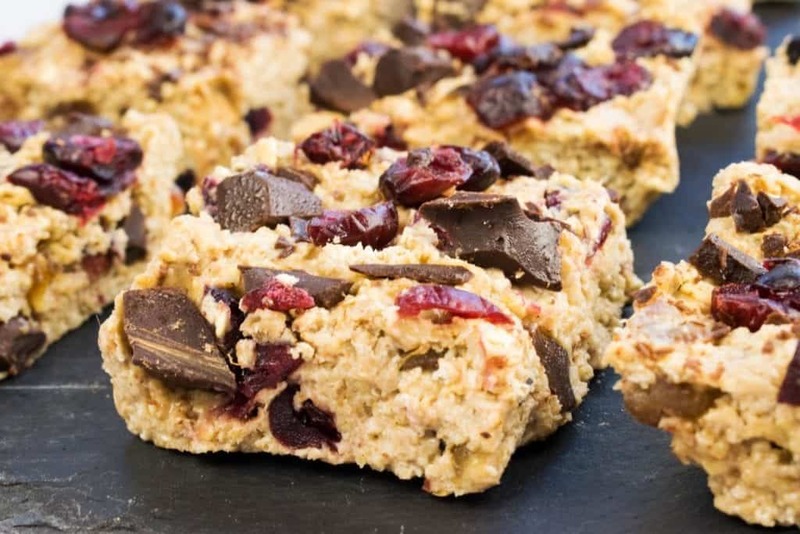 DON’T FORGET TO PIN THIS HEALTHY NO BAKE CRANBERRY & CHOCOLATE BREAKFAST BARS RECIPE FOR LATER! Honestly, I don't like oatmeal for breakfast regularly. 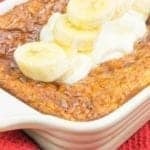 This is a very easy and incredibly delicious recipe solution that you have provided for everyday healthy breakfast woes. I am definitely going to try this and get them ready in a batch. They can even serve for the sudden hunger pangs. I love every single one of these ingredients so I'm pretty sure I'd get addicted to these bars...love that they're no bake! Any time "chocolate" and "healthy" are in the same sentence, I'm sold! These bars look so delicious! Definitely need to make these for an on the go breakfast! I love anything that allows me to eat chocolate for breakfast and not feel guilty. These would be great as a snack too! love the combo of cranberries and chocolate in these. bonus that they are no bake and seem simple to make!! Love the combo of cranberries and chocolate in this! And they're healthy? Count me in! I can NOT believe these are gluten free. I keep finding so many options that really help me with gluten allergies.Cranberries and Chocolate are a greta combo! These no-bake bars are perfect for breakfast on the go! I'm always looking for new ideas that let me grab breakfast in the morning when I'm in a rush! Great recipe. Cranberries and chocolate go so well together. Loving the sound of these bars. Looks like this can be one of my Valentine special Gifting options to my loved ones. Looks so healthy, perfect and delicious and crunchy. 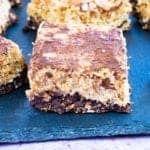 Delicious combination in these no bake bars. something amazing for breakfast. Love these. These breakfast bars look so delicious. I love the sound of the dried cranberries against the chocolate. Yum! These no bake cranberry bars will make a great breakfast for my girls. I'm always looking for new things to feed them in the mornings and these will be perfect because they have chocolate. Mmmm, these look perfect! Love all the textures and flavors goin' on in these bars. Dried cherries would be delicious in these too. Thanks for the recipe!